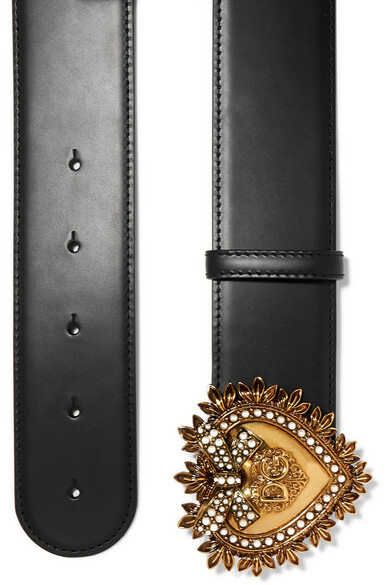 Dolce & Gabbana loves an hourglass figure and makes pretty belts to achieve the silhouette. This one is made from black leather with a velvety suede underside, so it sits nicely over a dress or jacket. The weighty gold buckle is detailed with faux pearls and the label's monogram. Shown here with: Dolce & Gabbana Pants, Dolce & Gabbana Blazer, Laura Lombardi Earrings.